Another big lawsuit in a year that’s seen plenty of them. The decades-old legal battle between states’ rights and civil rights returns to a familiar venue – a federal courtroom – on Monday as lawyers for the state of Texas try to convince a panel of judges that the U.S. Justice Department has no legal authority to block the state from immediately implementing a voter ID law. Civil rights groups contend that Texas’ 2011 law requiring voters to provide identification with a photo issued by the state or the military discriminates against minority citizens and violates the federal Voting Rights Act. They say it harkens back to state laws designed to disenfranchise minorities, such as poll taxes and literacy tests. Thirty-one states require voters to show identification at the polls, including 15 that require photo ID. The U.S. Supreme Court upheld the right of states to require identification cards in a 2008 Indiana case, but the Justice Department has rebuffed laws in two states covered by the Voting Rights Act, Texas and South Carolina. New ID laws in Mississippi and Florida are awaiting Justice Department action. 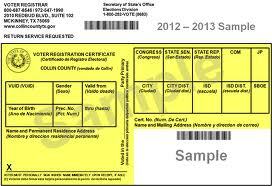 While the National Conference of State Legislatures, which tracks voter ID laws, reports there is little evidence to bolster claims of voter fraud or discrimination, [Texas Attorney General Greg] Abbott cites 50 election fraud convictions in Texas and more than 100 defendants prosecuted by the Department of Justice in the past decade. Even if you accept Abbott’s numbers as gospel, he’s talking about ten people prosecuted per year. That’s out of over 100 million votes cast in a year like this. There are industrial processes that have higher error rates than that. You’ll note that Abbott doesn’t mention how many of those federal prosecutions ended in convictions, nor does he say how many of either the federal or state cases involved the kind of in person fraud that voter ID is supposed to prevent. There’s a good reason for that. This is what happens when you base your case on a lie. What also happens is that you needlessly threaten the rights of a whole lot of people. Despite perceptions, there are between 600,000 and 800,000 Texas voters — out of 13 million registered voters in the state — who cannot be found in the records of the Texas Department of Public Safety, meaning they could represent voters without valid licenses or ID cards, according to data from the secretary of state’s office. Proponents of the law take exception to the numbers, saying that voter rolls are not purged often and many of the 600,000 to 800,000 voters are dead. Also, some of the people without DPS matches could still have DPS-issued driver’s licenses or IDs under abbreviated or maiden names, or there could be data entry mistakes, said Rich Parsons, a spokesman for the secretary of state’s office. El Cenizo resident [José] Zuniga, who said he was originally from Big Spring in West Texas, epitomizes the bloc of voters who could be denied the right to cast a ballot at the polls: He’s elderly. He’s a minority, and he’s poor. He also lives in South Texas, where the voter ID law would have the greatest effect. Eight of 10 of Texas’ counties with the highest percentage of registered voters without a DPS-issued identification are in South Texas or near the border, according to figures supplied to the Department of Justice by the secretary of state’s office. For Zuniga, voting is something he is passionate about. When asked what he would do if he were turned away at the polls, Zuniga said something in Spanish that, if translated, could not appear in a daily newspaper. Then, after falling silent for a moment, Zuniga displayed frustration at the idea that someone — once again — might be questioning his nationality. It’s unlikely that Zuniga will get a valid and required form of ID — an American passport, military ID, Texas driver’s license, free or paid-for DPS personal identification card, U.S. citizenship certificate or state-issued concealed handgun license — before the next election. He’s frail, and getting around is too difficult. It would take two or three buses to get to the closest DPS office in Laredo, which is about 20 miles away but for Zuniga might as well be 200. There’s a lot of people in this state like José Zuniga. Greg Abbott thinks they don’t exist, and even if they do he’s not bothered by telling him that his right to vote doesn’t matter. When do you suppose was the last time someone was in a position to tell Greg Abbott that he doesn’t matter? You can see the list of witnesses here, a brief overview of the case here, and a press roundup here. Needless to say, Texas Redistricting will be an invaluable resource throughout this trial. And as big as this is, it’s sadly only one of many fronts in the war on voting rights, along with Mississippi, Pennsylvania, and a whole lot of other places. The Texas voter ID preclearance trial is a big deal, but it’s far from the only deal. I read that Greg Abbott has sued Washington twenty-four times in the past ten years, can anybody tell me how many of those cases he’s won? Apparantly only about half of them have been decided so far, and the tab is up to about $1.5 million, which sounds cheap considering that he’s hired outside legal help for all this. Of course, to hear him tell it, he’s been winning, like in the Affordable Healthcare Act suit where they won only on the medicaid portion. A bunch of GOP jackasses attempting to disenfranchise voters to purely retain power. Its obscene.